Visual storytelling drives the need for a business’s video marketing plan. 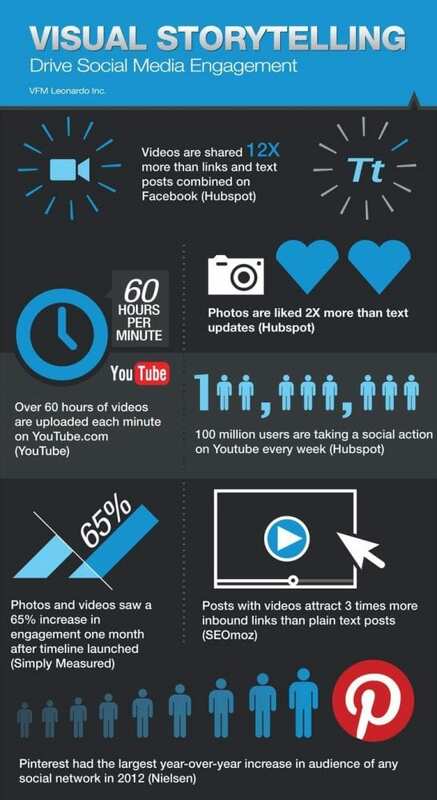 Videos are shared 12 times more than links and text. This applies to social media and other avenues of interpersonal sharing. Anything your business posts with a video will get three times more links than a plain text post. Simply put, video captures attention. But, what about engagement? What specifically about video makes it so prime for marketing engagement? Today’s share comes from Dr. 4ward. Starting with the fact that 100,000,000 users are taking social sharing action on YouTube every week, businesses can draw out qualified lines of thought. This daily pattern of sharing and watching videos doesn’t go away. Tracking shared photos and videos shows that they continue to enjoy a 65% increase in engagement for up to a month after initial viewing. Is print dead? Well, it’s not doing your marketing plan any favors. Consumers live in a mobile world of growing immediacy. Visual storytelling puts the consumer first and creates an elevator pitch for a new era. After all, who is going to attract consumers first? A text heavy site that requires a studious investment or a short video that presents everything they need to immediately know about a product/service? Feel free to browse Autodemo and find examples of how our visual storytelling drives engagement.